In March 1918, three Nieuport 28 scouts of the 94th Aero Squadron became the first American aircraft to fly over the enemy lines on the Western Front. 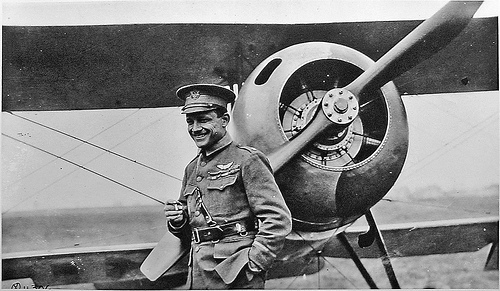 Leading them was Major Raoul Lufbery, with 16 confirmed victories in air combat. In formation with him were two rookie pilots: Doug Campbell and Eddie Rickenbacker. 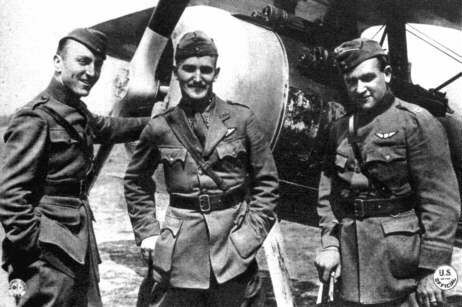 In fact seven American volunteers flying with the French and the British had already achieved the five victories required to ‘make ace’ – but all previous scores were annulled upon the creation of America’s own air arm. As commander of the 94th Aero Squadron, Lufbery – whose parents emigrated from France when he was six years old – found himself in command of a bunch of raw recruits. The majority of them were fresh-faced college boys… but then there was Rickenbacker. The square peg in a round hole. ‘Rick’ detested the privileged backgrounds and sense of superiority exuded by his fellow pilots – most of whom he had given hell to in training, when he was detailed to manage the logistics and maintenance of the flying school. He named them the ‘million dollar guard’ and – out of his hearing – they joked that he was a German agent. For all their wealth and privilege, the other pilots resented Rickenbacker’s pre-war fame and his clear enjoyment of celebrity status. He was regarded as uncouth, domineering and profane – and undoubtedly for good reason. Rickenbacker approached the job of being a fighter pilot like a tradesman. While the collegiate around him would often indulge in horseplay, the off-duty Rickenbacker spent his time on the ground working on his aircraft, checking its guns and obsessively scrutinising his ammunition for faulty rounds. By doing so his aim was not only to survive, but also to create the best chance of shooting down enemy machines. As a racing driver he had not won a major prize but as an airman he could yet join the ranks of Guynemer, Richthofen and Ball as a hero – and all the wealth and privilege it might bring him in peacetime. Although Lufbery scored a victory on 12 April it remained unconfirmed, thus the first enemy aircraft to officially fall to American guns was claimed by Douglas Campbell two days later. It would be another 15 days before Rickenbacker managed to get a claim recognized – a Pfalz D.III shared with another 94th Aero Squadron pilot, the Harvard-educated writer James Norman Hall, who would later write the swashbuckling classic, Mutiny on the Bounty. Rickenbacker later admitted that he was spraying bullets all around the vicinity of the doomed machine and, perhaps, the more experienced Hall – a Lafayette Escadrille veteran – had done the lion’s share. Nevertheless, Rickenbacker’s relentless approach meant that soon he was scoring regularly and in contention to become America’s first ‘ace’. One man who was out of the running for that title was Raoul Lufbery who, like so many of the old hands, was to fall in the final months of the war. The legend went that on 19 May Lufbery’s aircraft caught fire during low-level combat over his own airfield and, having climbed onto the wing in desperation, he fell, wreathed in flame, to his death. That’s certainly the version that Rickenbacker’s memoirs preferred. 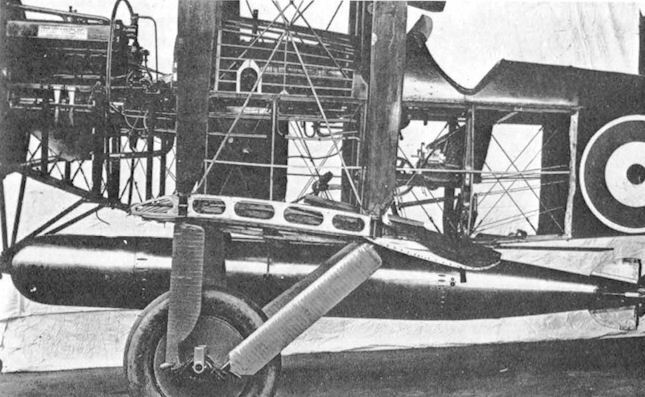 In fact, Lufbery’s aircraft is believed to have hit turbulence after he had undone his straps to fix a jammed machine gun and he was simply thrown out of the cockpit. Not an uncommon fate, as it turns out – although perhaps too ignominious for so great a warrior. Lufbery’s demise meant that Harvard-educated Douglas Campbell was the only man standing between Rickenbacker and the title of ‘ace’. 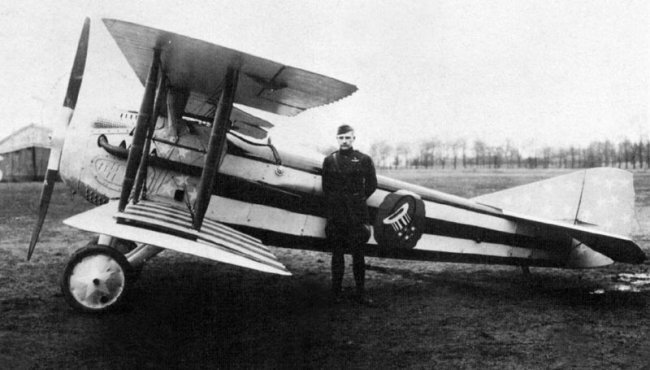 On 28 May the two men patrolled together and brought down an Albatros two-seater, which, through a clerical error, was credited to Rickenbacker alone. Much to Campbell’s chagrin, ‘Rick’ never attempted to correct the mistake. Nevertheless it was Campbell who, on 31 May, was officially credited with being the first American to reach five victories. He would score only one more before a bullet wound in the back saw him miss all but the few final days of the war. Rickenbacker had himself ‘made ace’ by the time that Campbell was invalided back to the USA – but his own score would also remain at six until September. A chronic ear infection took ‘Rick’ off the squadron strength for almost three months and, when he returned to action, the 94th was a very different unit – not least because the Nieuports had been traded in for Spad S.XIII machines. Rickenbacker adored the fast, strong V8-engined fighter. In the space of six weeks, he was credited with destroying five observation balloons and 15 aircraft at the helm of his Spad – of which 13 were the superb Fokker D.VII fighter. The other pilots who had previously detested him at first begrudgingly indulged him and then even began to warm to him, while he rose to become first flight commander and, later, Captain and commanding officer. He could be insufferable, profane and egocentric – but he got results. 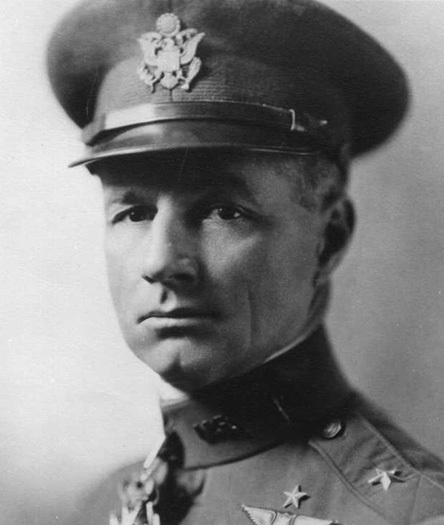 During this period another American pilot, Merian C. Cooper, entered the fray. Cooper was a cinematographer who would later create the ‘creature feature’ genre with Chang (1927) and, most famously, King Kong (1933). But in 1918 he helped create Eddie Rickenbacker’s star appeal by filming from the rear seat while Jimmy Meissner flew an Airco DH4 bomber as a camera plane (its cockpit rigged up to look like a Spad from the camera’s viewpoint). Completing the formation was a captured Hanover two-seater that was usually employed for air-to-air practice. Two 94th Squadron stalwarts, Reed Chambers and Thorn Taylor, piled gleefully aboard the Hanover to play the roles of a devilish Hun crew for Cooper’s camera. The trio then staged a fight and successfully filmed it – although the formation drifted over the lines, attracting plenty of unwanted attention! A segment of the film can be seen below, with Rickenbacker looping and wheeling his Spad, dubbed ‘Old Number 1’, around the ‘Huns’. 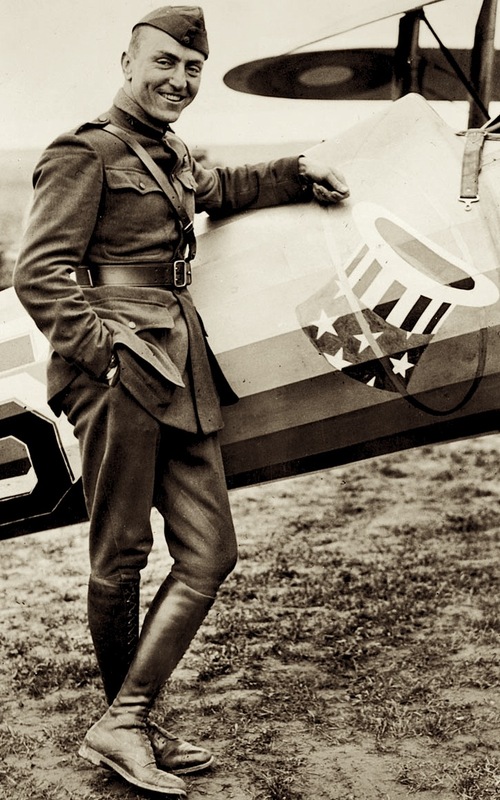 While building his legend, ‘Captain Eddie’ was determined to lead by example: he ordered incessant practice and instruction for his men and did his level best to ensure that the 94th Aero Squadron would go down in history as one of the elite fighting units of the war. He was hard on the men, but insisted that nothing he asked was a job he would not willingly do himself – and proved this time and again. At the end of the war, Rickenbacker returned to the USA as the people’s champion with 26 confirmed victories and the Medal of Honor, seven Distinguished Service Crosses, the Légion d’honneur and Croix de Guerre glittering on his breast. He would go on to live a life of extraordinary success, crushing failure and superhuman courage – but always in the guise of ‘Captain Eddie – Ace of Aces’. The 94th Aero Squadron returned as the embodiment of Yankee-Doodle brilliance; with its fleet of Spad fighters resplendent in an array of star-spangled, candy-striped and lightning-flashed personal liveries that made Richthofen’s Flying Circus appear positively frumpy. Today when we look at photos of Captain Edward Vernon Rickenbacker, we see the splay-legged stance, flashing grin and devilish eyebrows. He is the embodiment of the great action hero – primarily because it was this image that he sought to portray. There are tens of millions of extraordinary stories from that conflict. What’s truly remarkable is that Eddie Rickenbacker himself so successfully stage managed his own story to reach out to millions. Rickenbacker wanted to be an icon: the embodiment of a unique ‘up-and-at-‘em’ attitude that he believed should be the cornerstone of society. By any measure he succeeded. The commemorations to mark 100 years since the start of World War 1 have now passed. Each centenary that follows over the next four years at Ypres, Gallipoli, Verdun, the Somme and elsewhere – will have its fair share of myth and reality to choose from as we continue to honour those stories. As ‘Captain Eddie’ has long shown: there is value in both. On 6 April 1917, the United States of America decided to join the Allies in the Great War against the empires of Germany, Austria-Hungary and Turkey. From that moment, celebrated racer Eddie Rickenbacker was going to war – and he was determined to do so in the guise of a dashing fighter pilot. Yet on that historic day America’s army air service numbered exactly 65 officers, of whom 26 were pilots, plus just over a thousand non-commissioned ranks and civilian support staff. To compound matters, its naval air service was a fraction of that size. Gearing up for war would therefore be a large, costly and convoluted job – not least because aircraft manufacture in the USA was a political and litigious minefield. Having successfully convinced the world that they were the first men to achieve powered flight, the Wright brothers had patented so many basic aircraft components in the USA that only a handful of aircraft manufacturers existed. Wilbur Wright may have died in 1912, but his brother Orville fought hard enough for the pair of them to keep their name at the forefront. If one wished to design and build flying machines in the USA, therefore, the prerequisite was sufficient backing to pay for the inevitable legal fees resulting from Orville Wright’s patent claims. The result was a stagnant industry incapable of producing an aircraft as modern as those in action over the Western Front. While the bureaucrats got to work on unravelling that particular nightmare, General John J. Pershing was appointed as commander of the American Expeditionary Force. 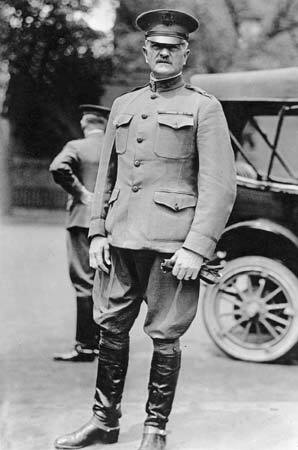 Pershing began to piece together a command team to cross the Atlantic, and among their number was a staff driver put forward for the job by the American Automobile Association – and that driver was Eddie Rickenbacker. A coincidence? Not entirely. For one thing, the British secret service had informed the American government of its suspicions that the former Eddie Reichenbacher was an agent of the Kaiser. Doubtless this ‘dodgy dossier’ played a small part in Pershing’s approval of Rickenbacker as one of his team – to underline that the US military’s business was nobody’s but its own. It also cannot have escaped Pershing’s notice that Rickenbacker had enjoyed very recent access to the heart of Britain’s industrial war machine. Through his relationship with Louis Coatalen at Sunbeam and his trips to the aircraft development centres at Brooklands through the winter of 1916-17, Rickenbacker had been given extraordinary access to aeronautical developments. The most important beneficiary of this knowledge would be America’s leading proponent of air power, Lieutenant-Colonel Billy Mitchell. He was already in France working hard to build the networks that he would need to train and equip American pilots for duty – and Pershing, who had used aircraft in his pursuit of Pancho Villa in the Mexican borders, wanted to give him every assistance. The unlikely role of General Pershing’s chauffeur did not sit easily with ‘Rick’. The dour, disciplinarian career soldier and the vigorously self-promoting racing driver were an odd couple. On one occasion, when Pershing was travelling with the commander of the French army, Marshal Pétain, Rickenbacker attempted to beat a train to a level crossing – risking two invaluable military leaders and proving that the main requirements to be a professional racer are a brain the size of a pea and an ego the size of Kansas. Pershing palmed Rickenbacker off on Mitchell at the soonest opportunity. Together they travelled the Front, visiting both front-line squadrons and commanding officers discussing tactics, strategic requirements and supplies of aircraft. They also encountered journalists from publications such as l’Auto, to whom Rickenbacker gave good copy as he insisted that he would soon be flying fighters and shooting down Huns. 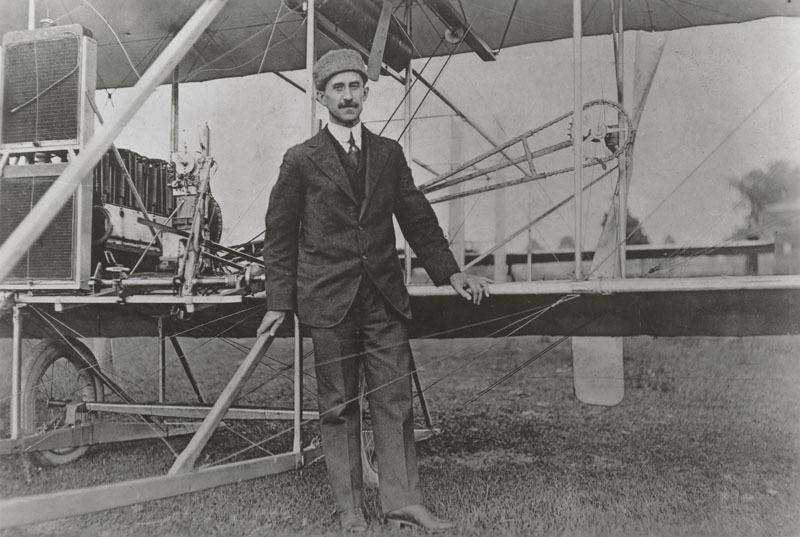 At this time Rickenbacker encountered James E. Miller, a racing fan who was establishing the first American flying schools in France, and soon Mitchell agreed to transfer Rickenbacker to the role of his engineering officer. By the summer of 1917 a total of 47 candidate pilots had arrived from the USA for basic flight training in France. 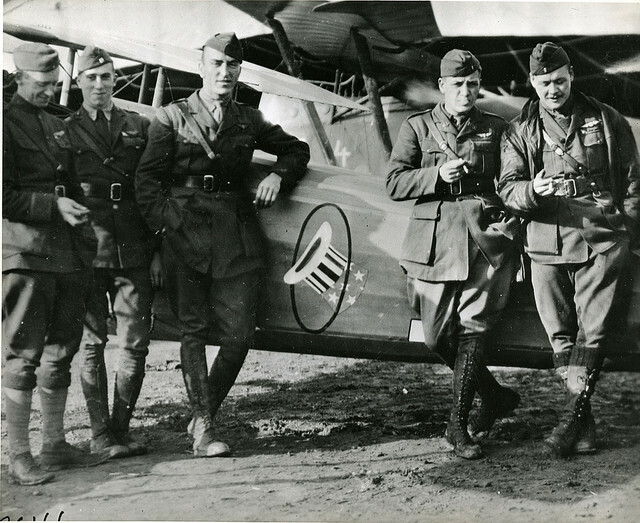 In addition the Lafayette Escadrille of American volunteers was absorbed, bringing a total of 93 highly experienced airmen to bolster Mitchell’s fledgling air force. In the autumn a fresh draft of recruits arrived for training and finally Rickenbacker was permitted to join them. It was not simply a case of granting permission – the maximum age for trainee pilots was 25, so officially two years were deducted from Rickenbacker’s age that were seldom, if ever, replaced in subsequent histories. Despite the occasional accident he survived 17 days of intensive flight training that took him from a complete novice hopping around the airfield in a clipped-wing ‘penguin’ airframe to a licenced, brevet-wearing pilot. This was not immediately followed by glorious battle, however. Instead Rickenbacker went back to his engineering officer’s job, where his unfinished education and brash manner contrasted sharply with the wealthy college boys who formed the majority of the trainees. He called them the ‘Million Dollar Guard’ and made their lives as miserable as any drill sergeant could have done. This behaviour caught up with Rickenbacker when, in January 1918, his bosses relented and sent him to gunnery school in preparation for front line flying. Rickenbacker was stationed with and flying alongside the very same young men that he had only recently been terrorising… to mutual chagrin. 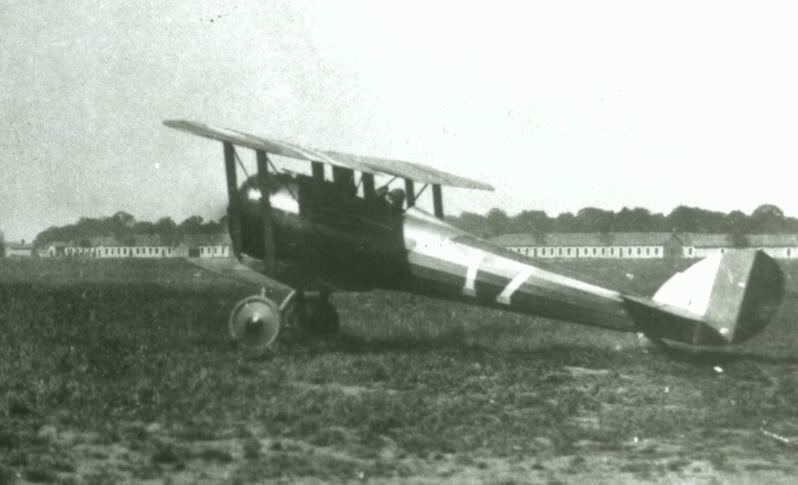 Two ‘pursuit’ units had been established with single-seat fighters sourced from France: the 94th and 95th Aero Squadrons. In March 1918 Rickenbacker would join the former, whose Nieuport scouts were branded with a star spangled hat sitting within a circle – letting the enemy know that Uncle Sam had truly thrown his hat into the ring. 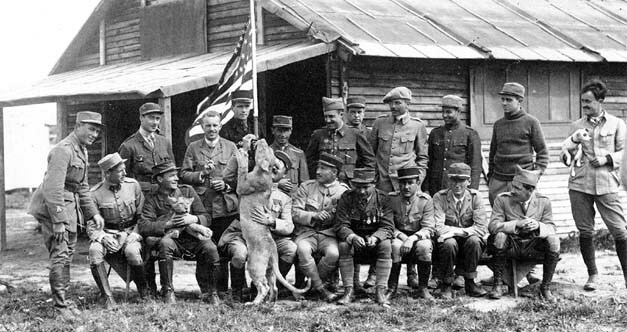 The 94th was initially commanded by Raoul Lufbery, the veteran hero of the Lafayette Escadrille. 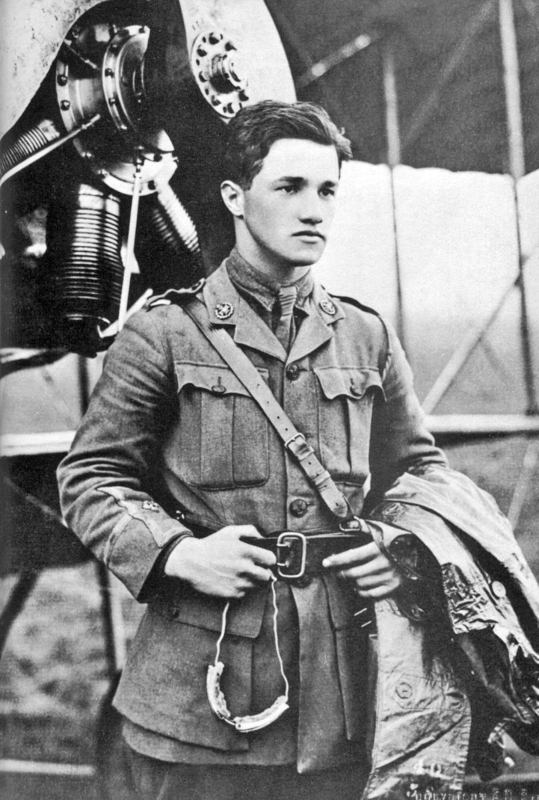 Although he had been flying and fighting over the Front since 1915, and amassed 16 victories in combat, when Lufbery led the first American patrol over enemy lines on 6 March he did so on a level footing with the two rookies in his care: Douglas Campbell and Eddie Rickenbacker. The victories accumulated by American pilots in other services were effectively annulled. This meant that there would be a race to become the first official American ace fighter pilot of the war – and Rickenbacker had his eyes on the prize. By late 1916, ambitious young Eddie Rickenbacher had risen from a teenage manual labourer to become a celebrated racing driver going by the name of Edward Vernon Rickenbacker. What he needed more than anything was to win a race of international standing – ideally the Indianapolis 500 – but to do so he needed European technology. The Great War had enveloped continental Europe, but even in these dark days the desire of European manufacturers to go racing burned brightly. 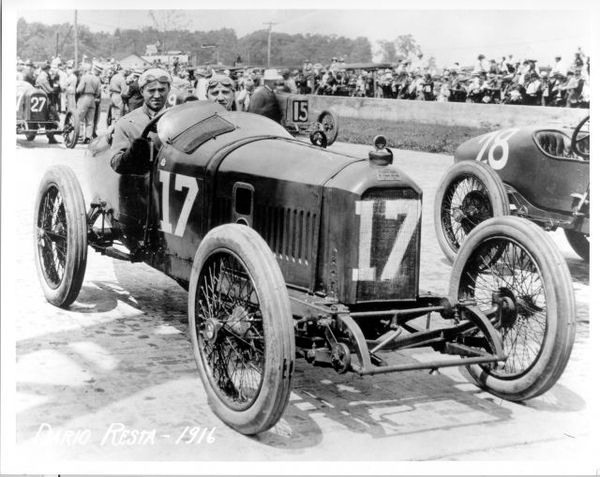 In America the great French marque Peugeot was cleaning up in the hands of its British-Italian driver Dario Resta, while the mighty German Mercedes was also a feature at Indianapolis. Britain’s leading team was Sunbeam – a major threat to the established marques before the war. 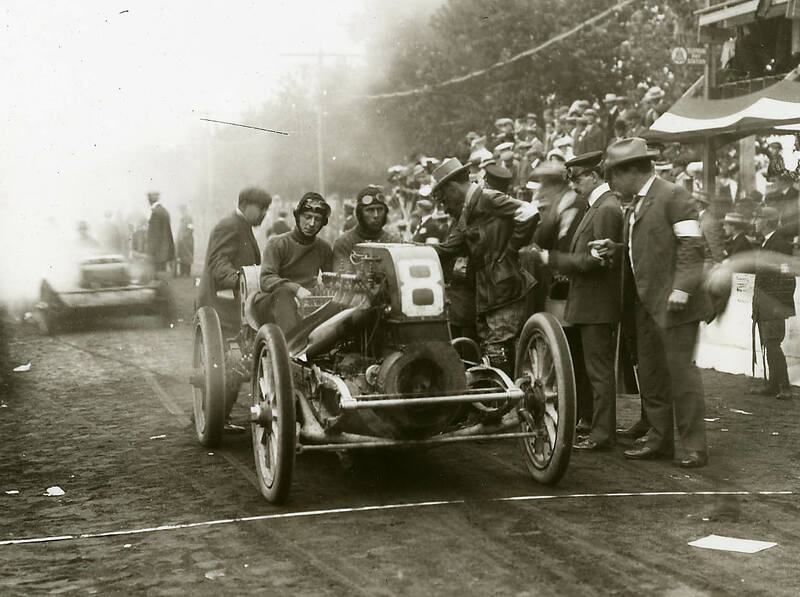 Under the guidance of its French leader, Louis Coatalen, Sunbeam had developed a car that offered Eddie Rickenbacker the hope of beating Peugeot at Indianapolis – a car that the ambitious driver craved. Through the autumn of 1916, Coatalen and Rickenbacker worked to piece together a deal for the following season. To seal the deal, Rickenbacker would have to travel to England. Before boarding in New York for his passage across the Atlantic, Rickenbacker closed out the 1916 racing season. While preparing for an event at Riverside, he chanced across an airfield, where he was greeted by the celebrated pioneering designer, Glenn Martin. Martin was pleased to give a celebrity racing driver a ride in his latest creation – which took all Eddie’s courage to accept – and before long it would prove to be a pivotal moment. In the meantime, Eddie’s next priority was reaching England. The documentation was organised but, unwittingly, he encountered two gentlemen on the voyage who took an interest in his Germanic surname. It turned out that they were British police, who arrested Rickenbacker as soon as they landed in Liverpool, a few days before Christmas 1916. During his detention, Rickenbacker was stripped and his skin was rubbed with lemon juice and acid to check for invisible ink before he was presented with a thick dossier of ‘evidence’ to prove that he was in fact an agent of the Kaiser. ‘The whole thing was so ludicrous that, instead of getting mad, I treated it as a joke,‘ he later recalled. 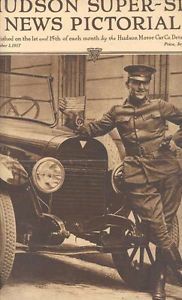 In fact, part of the joke was that the ‘dossier’ was based upon press information from Mack Sennett’s race team dating back to 1914 which claimed that Eddie was, in fact, Baron Reichenbacher – a wayward young Prussian aristocrat. The farce went on for several days until Rickenbacker talked his captors into speaking to Louis Coatalen, and almost immediately he was allowed to continue on his way to London. Coatalen had arranged for Rickenbacker to stay at the celebrated Savoy Hotel, where he was initially barred entry and fingerprinted at the local police station. Even after he was admitted to the building, this former gang member from Columbus, Ohio had no grounding in British manners, etiquette or vocabulary and thus found himself ostracised by staff and guests alike – during which time he developed a profound and lifelong Anglophobia. He felt much more at home on his weekly visits to the Sunbeam factory in Wolverhampton – although it was frankly preposterous that he, as an alien national, was allowed access to such an important military facility, distracting one of the foremost engineers in Britain’s war effort. 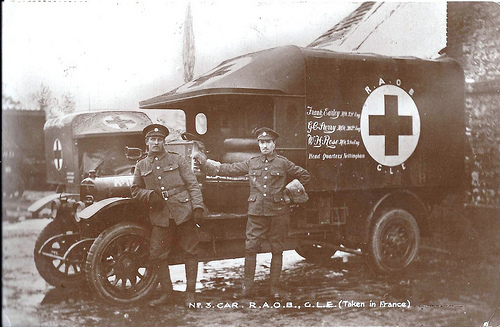 The Ministry of Munitions had ordered all available resources to be dedicated towards war work – and Sunbeam’s factory was expanding rapidly in order to build ever-greater numbers of staff cars ambulances, motorcycles, trucks, aircraft engines and airframes. As a result, Louis Coatalen, was working round-the-clock on a range of powerplants such as the V8 Arab and V12 Cossack aero engines, the air-cooled Spartan and diesel-fuelled Pathan. Yet he was also entertaining this brash American interloper and dedicating vital resources towards winning at Indianapolis. It was small wonder, perhaps, that Rickenbacker was not universally admired in Wolverhampton. Sunbeam may have been the great racing name in Britain before the war – but all that belonged to a different world of peace and prosperity. In the course of nearly two months of living and working in England, Rickenbacker grew accustomed to the war. Virtually all his peers were wearing khaki and the skies – particularly over London – were alive with the movement of aircraft. He was even permitted to visit Brooklands, the world’s first permanent race track but currently the major centre of design and production of prototype aircraft. The winter of 1916-17 was a time of relative quiet on the battlefield. The two great offensives on the Western Front in 1916, at Verdun and the Somme, had killed, maimed or simply lost almost two million men. It would take time to replenish losses like that, thus the air war provided the main talking points during Rickenbacker’s stay. Foremost in Rickenbacker’s line of sight was the story of the Lafayette Escadrille – a French fighter unit formed of American volunteers. They had been in action since the previous spring and was beginning to take a serious toll on the enemy, reaching 57 ‘kills’ by February 1917. Britain had a new hero in the cherubic-looking Albert Ball, who was fêted at every turn throughout Rickenbacker’s stay. Newspapers were also full of the exploits of French hero Georges Guynemer as well as stories of the emergence of an astounding enemy pilot flying a scarlet-painted fighter – the mysterious ‘Red Baron’. In a war where lives were lost and shattered in anonymous millions, the allure of these gloriously individual ‘aces’ was clear to see. They certainly left their mark on the American interloper, who spoke openly of a growing desire to join the battle in the sky. Rickenbacker’s curious English existence came to an end in February 1917. To start with, Germany announced its intention to attack all shipping in the Atlantic irrespective of nationality. Second, a plot was revealed whereby the German government had promised support to Mexico if it went to war with the USA over its disputed border territories. When this was discovered, diplomatic relations between America and Germany were severed forthwith while US nationals were recalled from Europe. That included racing drivers. After doing his best to finalise his plans with Coatalen and ensure that the Sunbeams could and would follow him to Indianapolis that May, Eddie Rickenbacker caught the last ship leaving Liverpool for the USA. However, all the plans and notes that he had made with Sunbeam over the previous two months were confiscated by the British secret service – and he would never get to the Indianapolis 500 in one of the British cars. 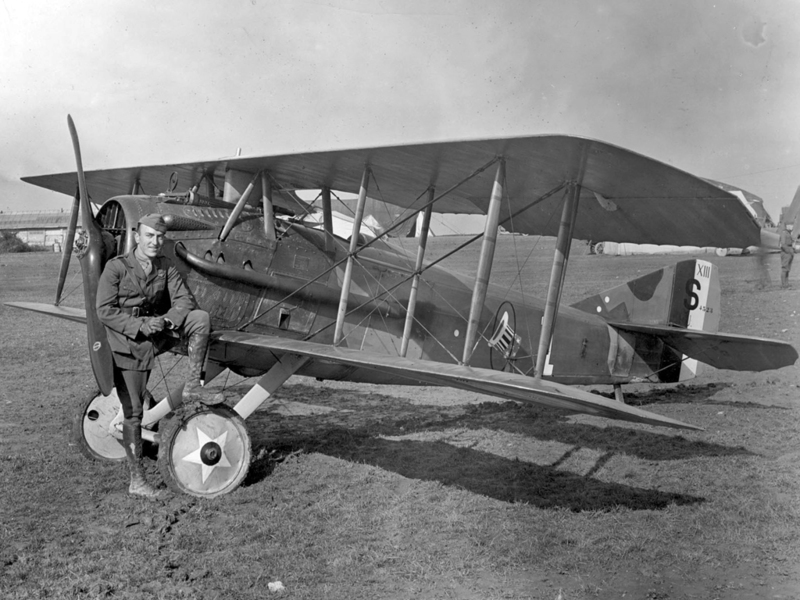 Upon his return to the USA, Rickenbacker began pursuing another goal: to lead a group of American racing drivers into battle – and to do so in the sky. If Eddie Rickenbacker couldn’t win glory on the racetrack, then he was going to go all-out to be an ‘ace’ and a star of the greatest competition of all. His aim was to gather 50 drivers and turn them into pilots for a new Lafayette Escadrille – but by the time that America finally declared war, in April 1917, he was still nowhere close to getting his plan approved. The war would soon come to Eddie Rickenbacker, but even for one as driven him, that war was too big a beast to come to him on his terms. After learning his trade as the protégé of pioneering automobile constructor and racing driver Lee Frayer, at the start of 1912, the 21-year-old Eddie Rickenbacher elected to become a professional racer. 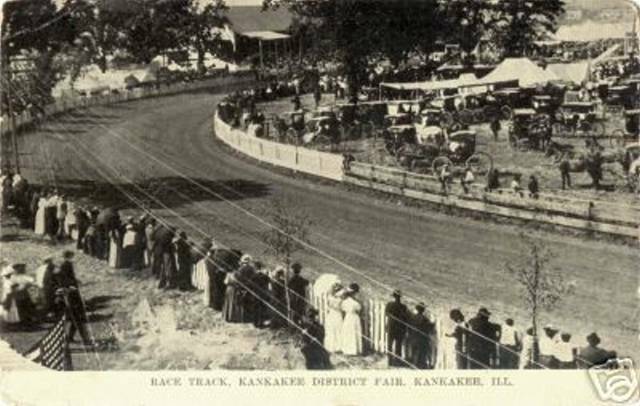 Throughout 1912 and 1913 his bread and butter was earned on dirt tracks and board ovals at county fairs and anywhere else that paid a buck for driving fast. Or, for that matter, driving slowly – a particular favourite of the crowds being a contest to see who could go slowest and finish last without stalling the car. When they weren’t racing, Eddie and his fellow drivers worked as handimen, mechanics and salesmen. Anything they could do to bring in the money they needed to get to the next racetrack and go at it – a travelling troupe of gladiators. It was a risky business for competitors and fans alike and disaster was never far away. In mid-1913 an incident at an event in Mason City, Iowa, saw Reichenbacher’s car hit spectators at an unlicenced motor race. As a result his licence was revoked until the start of 1914. After cooling his heels for several months, Eddie reappeared in California during February 1914 amid the most bizarre circumstances. 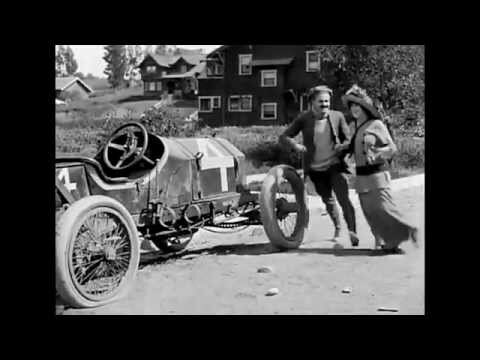 Mack Sennett, movie star and proprietor of the Keystone movie studios, was an enthusiastic patron of American motor sport. He owned and ran a Fiat grand prix car that he had entered in the 1914 Vanderbilt Cup Qualification Race in Santa Monica. During practice tragedy struck Sennett’s team when the big Fiat, driven by Dave Lewis, went out of control and ended up in the crowd. Six spectators were injured, among whom was the 69-year-old Civil War veteran, Louis G. Smith. Mr. Smith succumbed to his injuries and the Fiat was deemed too badly damaged to start the race – but Sennett was determined to win the greatest road race in America, so he invested in a year-old Mason racing car, which was entered for a new and apparently rather colourful replacement driver. 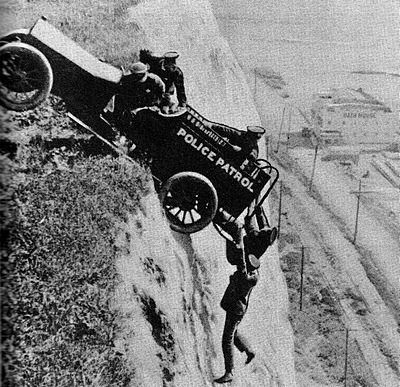 It was, of course, hokum worthy of one of Sennett’s two-reel slapstick adventures. The ‘Baron’ was none other than Eddie, but his starring role was not to last: unexpectedly heavy rainfall caused the race to be delayed for several days, in which time both Dave Lewis and the big Fiat were returned to active duty. Not only that, but Sennett convinced the race organisers to allow him to film the race for a new comedy feature – Mabel at the Wheel. 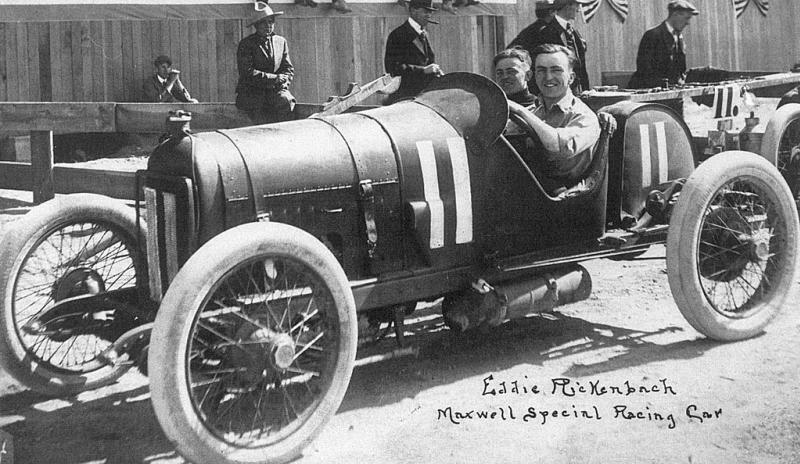 Nevertheless, Eddie was back racing once again – this time for the princely sum of $3 per week plus his share of any spoils – for a team run by two German-born brothers from Iowa who had been instrumental in designing Mason racing cars and were busy setting up their own team. They were August and Frederick Duesenberg. The Duesenberg brothers made Eddie their racing team manager as well as their leading driver. Their next race would be the 1914 Indianapolis 500 in which Eddie finished tenth, collecting a purse of $1,400. Five weeks later, in Sioux City, Eddie Rickenbacher won his first race, collecting $10,000 for his trouble and becoming one of the stars of American motor sport. Star status appealed to the young racer, who began to cultivate his celebrity. Stories were told that he had set speed records in the mighty Blitzen Benz during 1912 – fabrications that Eddie never troubled to deny. He also gave himself a new name, entering first as E.V. 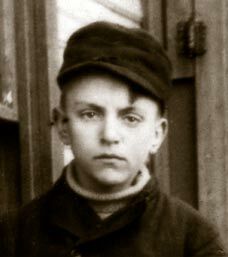 Rickenbacher (not having been given a middle name by his parents, Eddie chose the letter ‘V’ for its impact and, later, settled on ‘Vernon’ as his chosen name). In mid-1915 he completed the transformation by changing his surname to Rickenbacker. By this time, Eddie had parted company with the Duesenbergs, whose racing successes, while, impressive, did nothing for their finances. Instead he chose to drive for the current giants of European motor racing: Peugeot. Having won Italy’s Targa Florio and the Grand Prix in France, the rakish blue cars were now aiming for American glory – and Rickenbacker wanted to be the man to give it to them. Part of Eddie’s decision was influenced by the fact that the Peugeot team favoured racing on the open road. ‘I always preferred the challenge and variety of road racing to going around and around like a ball on a string,’ he later said. The roads were dusty and unpaved while the cars were faster, more powerful and noisier than anything Eddie had previously encountered. 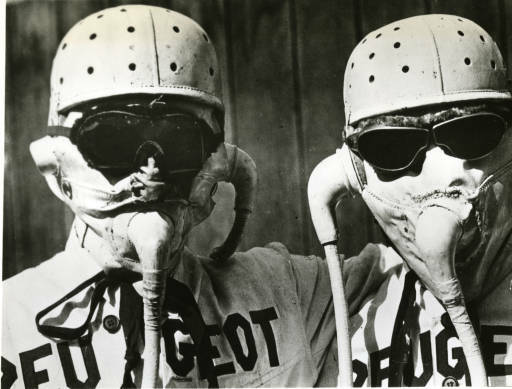 He was in love with the thrill of racing but also wary of its inherent danger, and so in order to stay in touch with his riding mechanic, Eddie fashioned facemasks which featured a rudimentary intercom. The facemasks worked but were not a spectacular success. Neither was Eddie’s time with Peugeot spectacularly successful – or long lived. The cars were beautiful and technically brilliant, but needed fine tuning and patience that, perhaps, their American keepers lacked. Furthermore, it was clear to Rickenbacker the star that American race fans wanted to see American drivers racing to victory in American machines. The final nail in Peugeot’s coffin for Rickenbacker was that Europe had become embroiled in war, and there was no guarantee that cars or parts would be readily available. Once again he jumped ship – this time joining the home-grown Prest-O-Lite team alongside Barney Oldfield and Bill Carlson, racing Maxwell cars. The irony was that Eddie’s seat at Peugeot was filled by the Italian-British driver Dario Resta, who proceeded to win virtually every major race in America – much to Eddie’s chagrin. 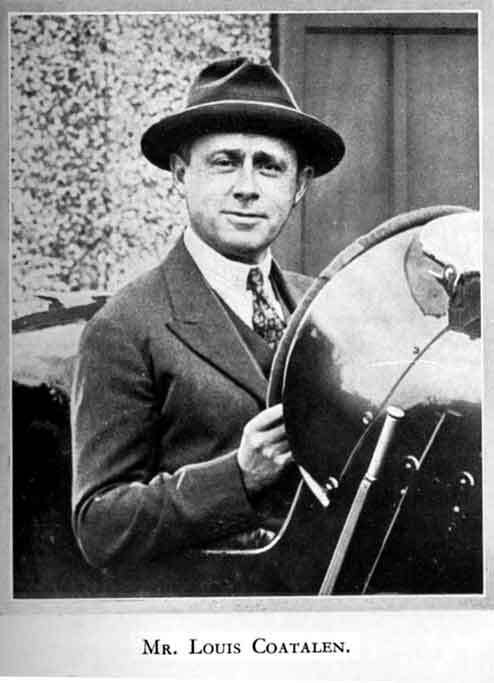 Nevertheless, the Maxwell years brought Eddie Reichenbacker his greatest successes and unprecedented wealth – earning $80,000 in 1916, when he was ranked fourth overall by the American Automobile Association. He also effectively ran the team – including the discipline of its staff and a series of secret signals to be carried on boards held up from the pit lane. The team triumphed in local and regional events, but at Indianapolis and the other major events its cars were outclassed. It was clear that to fulfil his ambitions, he needed the sophisticated engineering of a European car. Although near the peak of his profession in American racing, Rickenbacker needed a major title to cement his reputation and earning power – and, while American fans might prefer to see him win in American machinery, he would have to be pragmatic about it. Thus, in the winter of 1916, Rickenbacker opened dialogue with Louis Coatalen, the French design genius who had turned the British marque, Sunbeam, into a major sporting force before the outbreak of war. Coatalen had developed a 5-litre six-cylinder racing engine that was ideal for Indianapolis but currently gathering dust – opening an extraordinary chapter in the life of ‘Fast Eddie’. As the centenary year of the outbreak of World War 1 comes to an end, the S&G embarks on a bit of an odyssey to reveal one of its most celebrated participants. Let’s remember a pilot and racing driver whose name – or, perhaps, names – resonates on both sides of the Atlantic: Edward Vernon Rickenbacker. This story really begins on 18 July 1904, when William Rickenbacher, a Swiss-born employee of the Beasley Company, took his lunch break while laying the new concrete sidewalks in his adopted hometown of Columbus, Ohio. Another man, William Gaines, asked him to spare some of his food – and was told in no uncertain terms that any spare food would go home to feed his wife and six children. Until that point, Eddie Rickenbacher’s story had been entirely different. Responsibility did not come naturally to him: he had been a leading light of the Horse Head Club – a gang of rapscallions who regularly fell foul of the law. Upon his father’s death, however, Eddie threw himself into filling the financial void. First he took on manual labouring jobs, at a glass factory, a brewery, a metal casting company and finally a stonemason’s – during which time he diligently carved the word ‘Father’ on William Rickenbacher’s grave. Yet these were jobs redolent of the past. Columbus, meanwhile, was a city in flux: a vibrant industrial centre that had been known as the ‘buggy capital of the world’ but was now escaping the horse-drawn past for a future of man-made technology. Columbus embodied in the dozens of wooden arches that spanned the city’s High Street, each bearing electric light bulbs to illuminate the road. Eddie Rickenbacher grew to be a tall and rangy youth with hawkish features and a passion for new technology – principally the automobile. By the age of 15, Eddie was determined to find an outlet for his talents within the city’s burgeoning motor industry – and took himself to the Frayer-Miller automobile works. Lee Frayer and William Miller were, at the time, among the most exciting engineers at work in American automotive design. They had completed the world’s first six cylinder automobile, an air-cooled car boasting a prodigious 36 horsepower in which Frayer himself had driven single-handed in the world’s first 24 hour motor race. Soon afterwards, Eddie Rickenbacher presented himself to Lee Frayer and stated his intention to work for the company. 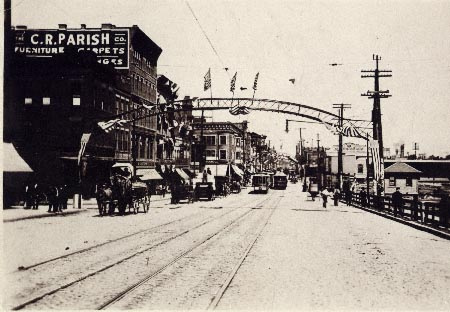 Frayer sent him away and headed out of town on business the following day. Yet, when he returned, Frayer found that the workshop was immaculately clean and the tools and working areas were spotlessly arranged. He also found out that some kid called Eddie, calling himself Frayer’s apprentice, had done all the work. Frayer relented and gave the kid the job he so clearly craved. While working hard to learn his trade, Eddie had also signed up for a correspondence course in automotive engineering. His commitment was absolute and, as a reward, Frayer invited this industrious youngster to be his riding mechanic at the 1906 American Elimination Trial. A new air-cooled four cylinder car was readied for the event, and together the Freyer team travelled to Nassau County, Long Island, New York, to compete with 15 other entrants for a competition over 10 laps of a 29-mile course. There were two days of practice and then the cars set off at 30-second intervals. While Frayer wrestled with the wheel, Eddie’s jobs were to keep an eye on the oil pressure, keep pumping the fuel pressure to a peak and to watch out for tyre wear and other competitors. They blew a tyre very soon into their first lap and, once it was fixed, Frayer drove flat-out – too fast, as it turned out. Eddie would recall that moment vividly later in his life. ‘A year of seven-day weeks, an outlay of $50,000 or more, and he hadn’t even finished the elimination run,’ he wrote. 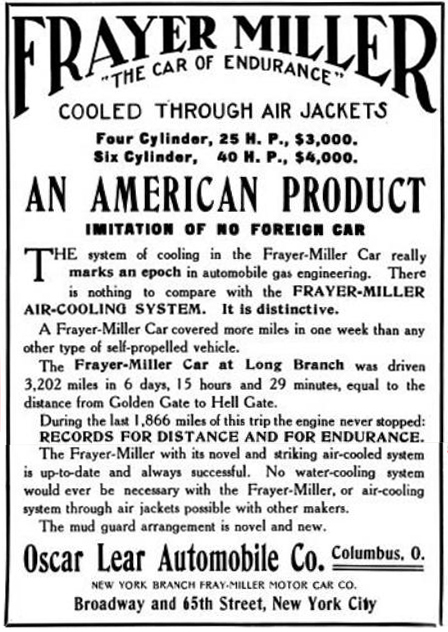 Frayer-Miller formed a partnership with the Seagrave company in 1907 to produce commercial vehicles. Yet competition was fierce and, by 1909, the Frayer-Miller firm was heading for the scrapheap. Climbing out of the financial wreckage, Frayer went to work for the rival Firestone Columbus company – along with his protégé, Eddie Rickenbacher. Despite the new opportunity, Frayer’s disappointment got the better of him and he turned increasingly to the bottle for solace. 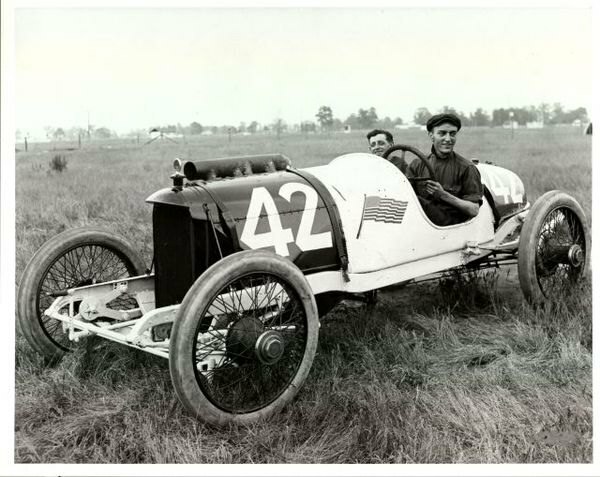 Eddie, meanwhile, applied his now-customary diligence and eagerness to the role of Sales Manager – and eventually this led, in 1910, to entering his first race as a driver, when he took the wheel of a Firestone Columbus on a dirt track in Red Oak, Iowa. He crashed out, but the intoxicating thrill of racing truly blossomed within 20-year-old Eddie. Yet once again the company that young Rickenbacher worked for was coming unglued around him. 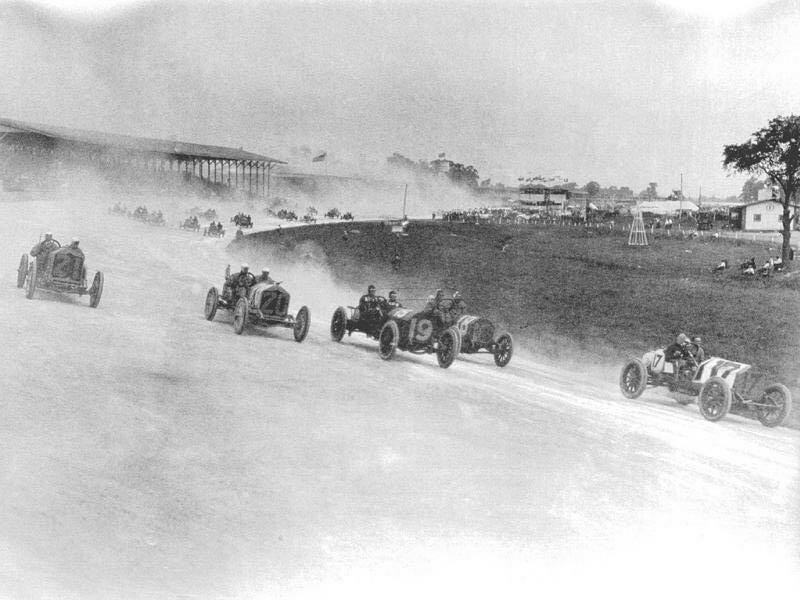 Yet it held together long enough to piece together an entry in the inaugural 500-mile race at the new Indianapolis Motor Speedway on Memorial Day, 1911 – and this proved to be the moment when a significant baton was passed. Lee Frayer was listed as the team’s driver, but the lion’s share of the driving fell to his uncredited 21-year old reserve, who took over the car after 12 laps and drove with aplomb until he handed it back to Freyer with only 100 miles remaining. Frayer would end the race classified 13th, three laps down on the winner, Ray Harroun, in the celebrated Marmon Wasp. 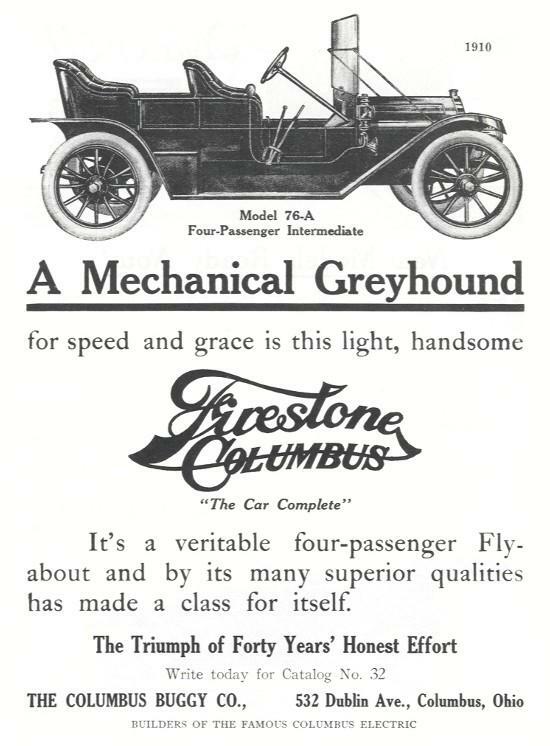 Soon afterwards Firestone Columbus passed into history and Eddie found himself out of work and alone. He decided to turn his back on the customer automobile trade and become a professional racing driver instead; a hired gun living on his appearance and prize money. ‘Fast Eddie’ Rickenbacher was about to go barnstorming on four wheels.